This week. This week has been a week. I've been tired all week long and just didn't really feel like doing all that much. I did my classes and I worked all week, but my heart wasn't just in it. When I meal planned this past Saturday, I decided to go easy on the meals because Day Light Savings Time and I are not friends. This week is always a little rough on me, so I gave myself a break. 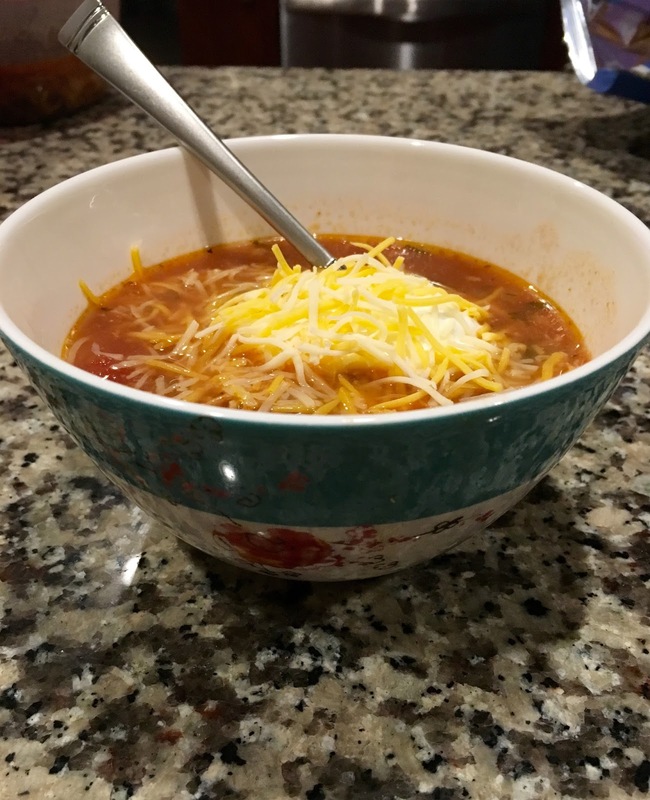 Since I talk about meal planning and cooking a lot on this blog, I thought I would combine our meal plan for this week and a review of a cookbook that I have been living out of the past few weeks. My friend Jess has forever been the one that finds these fabulous food bloggers and then gets me hooked. She got me hooked on Chocolate Covered Katie, then PaleOMG and Skinnytaste. 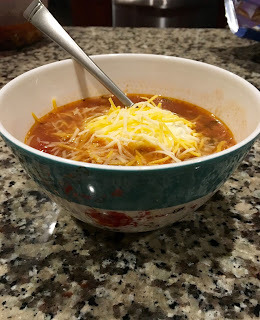 I've been using the Skinnytaste recipes online for a while, but when I saw her new cookbook in a store, I decided to try out her actual books. Because deep down, I'm a cookbook recipe kinda girl. I just got the new book from the library, but the recipes we did this week are from the original Skinnytaste cookbook. What I liked most about this book is that it's my kind of cooking. It's not Paleo, but it is good, healthy recipes. They aren't diet recipes or using diet ingredients, but good recipes revamped with healthier options. If I have learned anything, it's that diet isn't the way to go. Healthy is. I will be honest and say that Thursday's meal is actually a recipe from Papa Spud's and is not from this cookbook. It's amazing, easy and Paleo friendly, though! I tried to find a recipe online for you, but couldn't. Maybe I'll blog it soon! This week I did a different meal prep than normal. I did all my chopping on Sunday. I chopped all my onion, garlic, jalapeno and anything that would stay fresh until I used it. It's been glorious for cooking after class, but my fridge smells like a giant onion. Apparently I need to change out that year old baking soda that it's in there (don't judge). I also did a crock pot shredded chicken. The cookbook recommends doing three chicken breasts in the crock pot, then shredding them for meals later in the week. We did this for the Buffalo Chicken Melt. 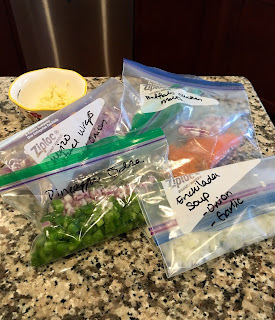 I'll probably keep doing this because it's great to have on hand for quick chicken salads! I chose this recipe for Monday because I knew I was going to be a whiny person Monday night. I had yoga and knew that I wasn't going to want to be super productive after that. The recipe says to cook the soup for 4 to 5 hours on low, so I went home at lunch and put the meal together. It's a super simple recipe: stock, tomato sauce, black beans, corn, onion, garlic, diced tomatoes, cilantro, spices and chicken breasts. Dump everything into the crock pot, cook on low for 4 to 5 hours, pull out the chicken, shred and dump back in. We served it with cheese, sour cream and tostitos chips. It made 6 good size servings. Leftover tip: Always make your leftovers before serving the food. Then you have what you need and people can eat whatever is left. I had six servings out of this meal. If left up to Aaron, I would have had maybe 3. Tuesday is my double class night - spin followed by TRX. I get home at 7:45, so to avoid eating at 9 PM, I always choose something easy. These were perfect! I took the shredded chicken, added in Frank's Red Hot, mayo, red onion and shredded carrots and mixed it all together. Frank's Red Hot is some magical stuff. The recipe called for tomatoes on the melt, but I didn't have any so I left them off. 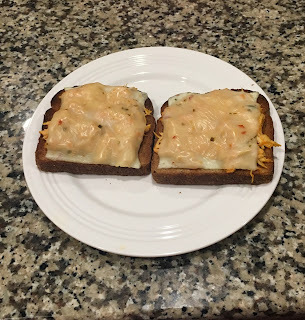 The melts were super easy to make - toast 4 pieces of bread, stack the buffalo chicken mixture on top and then put a slice of pepper jack cheese on top. Put under the broiler until the cheese gets all bubbly! This might be one of my new favorites! It was a little more complicated of a meal, but it still didn't take very long. I got home from class around 7 and dinner was ready at about 7:30. If you don't have a griddler, you need one. The plates pop off and go in the dishwasher! 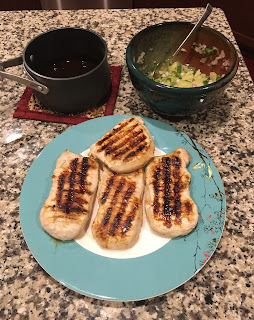 The teriyaki glaze was really good! But the main reason that this was so good were the pork chops - they came out perfectly! 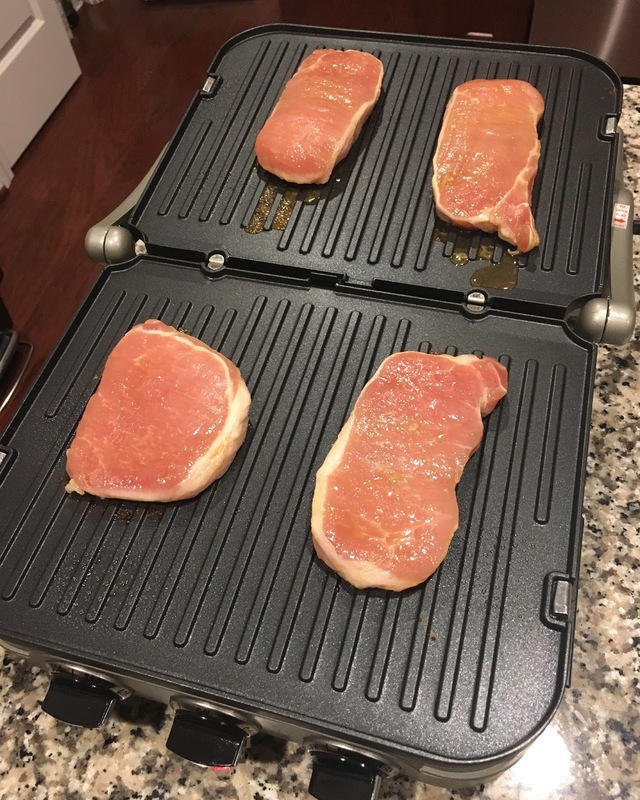 I made them on my Cuisinart Griddler. Seriously, I'm in love with that thing. I cooked them for 6 minutes on each side, then moved them all down to the bottom and pulled the top down for another 1-2 minutes. They were cooked perfectly! Even in the microwave for lunch the next day they turned out perfect! We paired them with Uncle Ben's 90 second long grain brown rice. Those are the recipes that we made this week out of the cookbook, but we've made so many others! So Addicted Chicken Enchiladas (amazing! ), Pear and Brie Grilled Cheese (which Aaron loved! 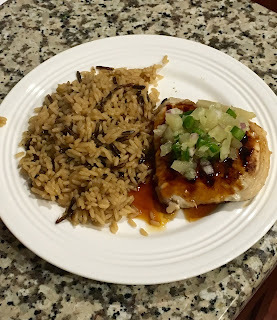 ), Sweet n Spicy Sriracha Glazed Salmon and Roasted Sesame Green Breans and Slow Cooker Santa Fe Chicken. Each recipe has been delicious, easy and, best of all, healthy! I like that the recipes aren't super involved and that they aren't all Paleo, although the book gives you gluten free options. I have so many cookbooks and I really don't need another, but I also really want to buy this one. I've made 8 amazing recipes out of it already! Maybe I'll wait and see how good the new book is before I make any purchases. 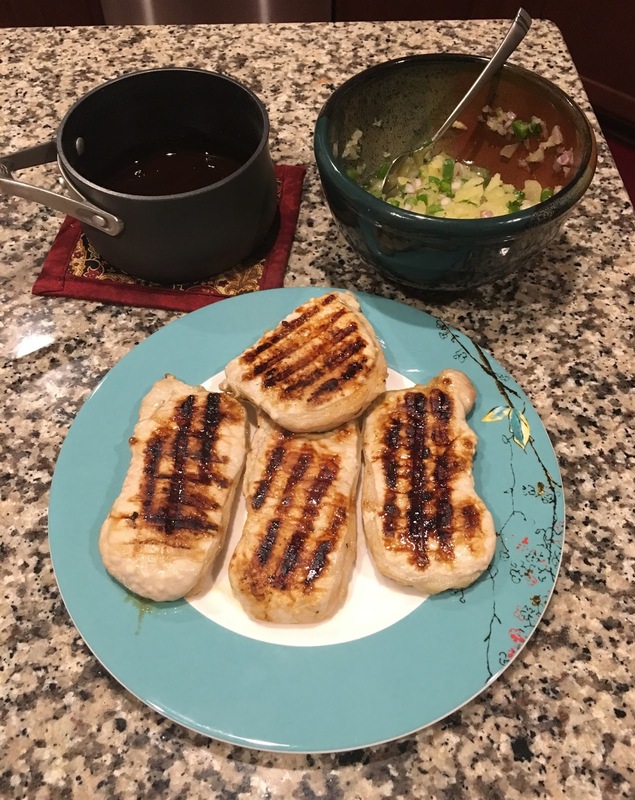 What did you make for dinner this week? And please tell me I'm not the only one dying from Daylight Savings Time!